Something incredible happened at a college in Massachusetts earlier this year. The largest Living Building (to be) in New England, the R.W. Kern Center, opened at Hampshire College in Amherst. For those of you who are unfamiliar with what it means to be a Living Building, here’s one of the primary tenants: a building certified as a “Living Building” by the International Living Future Institute (ILFI) must create more resources than it needs. Take water, for instance. A Living Building is responsible for giving water to the rest of humanity in addition to meeting its own needs, rather than taking it, Norris said. So who better to build this high-achieving structure for a college than one of its own? Jonathan Wright is the principal of Wright Builders, the project’s contractor, and also a Hampshire College alum. He brought a distinctive understanding of the objective to the center’s construction. If you’re thinking that’s a tall order, you’re correct. “From a designer perspective, it seemed very large and hugely difficult,” said Jason Jewhurst, senior associate at Bruner/Cott, the designer of the building. But when the project team of this 15,000-square-foot, multi-purpose center outlined and picked apart each individual challenge during the initial design charrette, it helped make this massive project seem more manageable. For the concrete floors in the R. W. Kern Center, the project team chose Consolideck LS and LSGuard, which met the stringent LBC materials criteria. What materialized was more of an opportunity than a challenge. The remarkable collaboration that occurred between all Kern Center team members is not all that common on typical construction jobs, many of the project players said. That unique sense of teamwork is echoed when you listen to Wright and Nielson speak about working with other project team members. While materials present perhaps the biggest trial, it’s also one of the most important elements of the LBC. Nielson of Bruner/Cott believes programs like LBC that disclose product ingredients are only going to become more and more prevalent. “The whole material thing I find analogous to what the food industry has gone through in the last 10 years where people are starting to realize that they should care about what they’re eating,” he said. 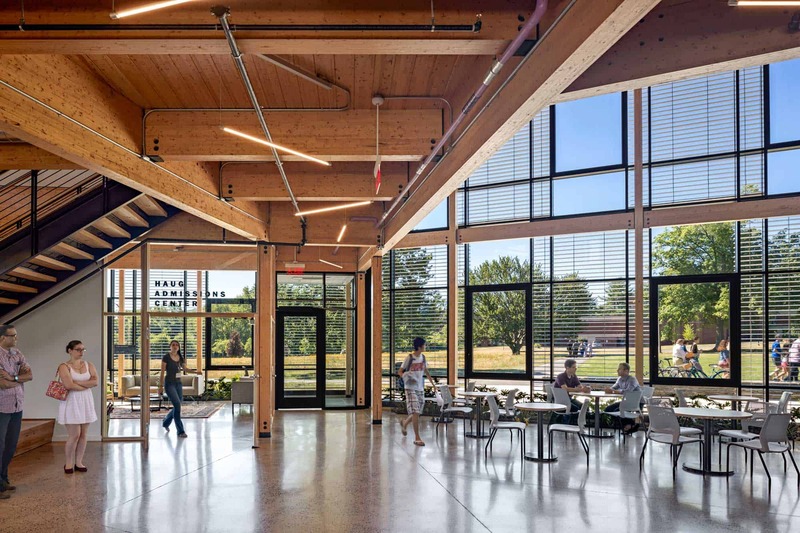 When it came to the Kern Center’s building envelope, the project team was pointed in PROSOCO’s direction from the team of another high-profile Living Building. During the charrette, Hampshire College President Jonathan Lash arranged for the group to sit down with the team that completed Seattle’s Bullitt Center in 2013. That peer review helped the group refine its schematic design process and learn the lessons from a team that had successfully completed a Living Building. "It's sort of like when you put asbestos in breakfast cereal because it adds fiber but it's not good for you. Get fiber some other way." It was in that discussion where the Kern Center team heard the story about PROSOCO removing phthalates from its R-Guard products. Borrowing a page from the Bullitt Center playbook, the Kern Center team used PROSOCO’s R-Guard FastFlash air and water barrier system on the building envelope. That system includes Joint & Seam Filler, FastFlash, Cat 5 and AirDam, all of which hold the Declare labels needed to comply with the LBC Red List. The vapor permeability of the R-Guard products played a crucial role in the wood-framed, 12-inch cavity, double-stud walls, Wright said. PROSOCO’s involvement in the Kern Center didn’t end in the walls. The project team also needed a sealer and protective treatment on the center’s concrete floors, and a water repellent to protect the exterior masonry. Tom Lane, PROSOCO sales manager covering New England, made frequent visits to the job site, worked with the team and provided training and support for PROSOCO’s Consolideck LS and Consolideck LSGuard, as well as Natural Stone Treatment WB Plus, which all meet the stringent LBC materials criteria and Red List conformance. Wright praised PROSOCO’s attitude and assistance during the meticulous product vetting process that can take up to several months. One unanticipated part of the Living Building Challenge was the value of relationships on the success of the project, said Bruner/Cott’s Nielson. One perfect example of that concept Nielson found in Dwayne Fuhlhage, PROSOCO’s sustainability and environment director. “(Dwayne and I) had conversations about, ‘What are some of the things that we can use? What are ones that are already on a Declare list that we know we can use? What are ones we’d really like to (use)?’ And because (Dwayne) is, from a professional standpoint and also I think from a deeply personal standpoint, invested in making these things work, those kinds of relationships are what allow us to find products like our air and water barriers on the outside,” Nielson said. On April 29, 2016, the Kern Center officially opened its doors in front of a crowd of students, faculty, administrators, and representatives from the companies involved in its creation. For those who played a part in the building’s development, it was a powerful moment. Part of that continued growth could be spurred by companies like PROSOCO that take a chance on the Living Building Challenge and its ingredients disclosure requirements, Wright said.